Red lenses are primarily used when hunting for nocturnal predators, such as coyotes, after sunset. During this time, human activity (campers, drivers, hikers and etc.) is generally lower, which allows the animals to move around freely with their guard down. Because of this, they are more responsive to artificial distress calls. Individuals use red lenses or hunting lights when scanning for predatory creatures. During scanning, the light (with a wavelength range of 620-750 nm) reflects off the animal’s retina. 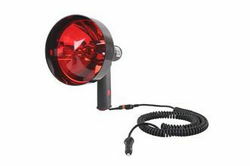 Many hunters also claim that red light does not spook or scare creatures away, when directing the beam of the fixture towards the animal’s line of sight. During application, it is best practice to keep the light beam moving quickly while calling to ensure wide coverage. After spotting a set of glowing eyes, one must first identify the animal to confirm the authenticity of the target. Next, move the edge of the beam to the eyes of the creature in order to maintain a steady glow. When you’re ready to shoot, move the main beam directly on the target and release the shot. The benefits of using a red lens during nighttime are numerous. Red lights are easy on the eyes, and contributes to less eye fatigue for humans. Without the use of expensive night vision gear, the fixtures can help preserve natural night vision. The color also has a calming effect on animals, increasing the chances of a positive response to a call. This allows the target to respond to the call genuinely, as if the red light did not exist. It is important to consider that red lenses can make brown, orange and yellow colors difficult to detect. Green lenses are applicable for long distance shooting, and for areas with domestic animals. Because the light is brighter, it is easier to identify targets in poorly lit conditions. Individuals hunting wild hog mostly use green light because they are able to see dark-colored hogs with minimal effort. White light is not ideal for night hunting because it obstructs one’s peripheral vision during usage. Furthermore, animals are known to react wildly under the presence of white light. This is because they acknowledge its presence as a possible threat, since the beam is an uncommon, unnatural element at night.